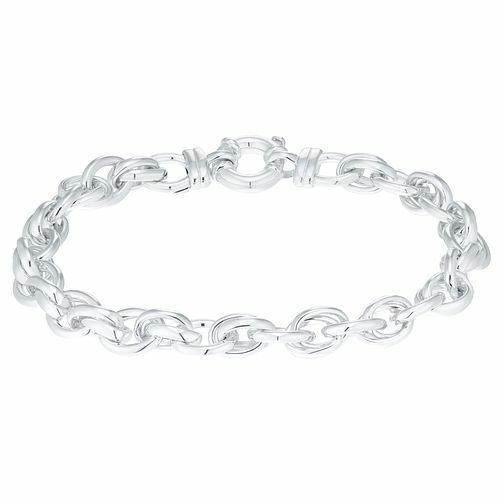 Enjoy the modern charm of this sterling silver bracelet, with wide curb chains linking together for an edgier, sophisticated look. Sterling Silver Linked Bracelet is rated 5.0 out of 5 by 2. Rated 5 out of 5 by Anonymous from Nice and chunky Absolutely love this bracelet. Had it bought for me at Xmas. It has a good weight to it. Solid and a secure clasp. Love it. Rated 5 out of 5 by Anonymous from Silver link bracelet Beautifully designed bracelet . Strong clasp . Heavy in weight confirming its value .